Diverse and strong collaboration with international and Russian partners Publications in top journals. Relevant bachelor’s degree, or its equivalent in Mathematics, Applied Mathematics and Physics. Basics of combinatorics, Elements of group theory, Linear algebra, Topology, Limits of sequences and functions, Derivatives and differentials, Geometry: affine and projective spaces, maps, second-order curves (conics), Complex analysis, Ordinary differential equations, Classical mechanics, Classical electrodynamics. (See the details here). The entrance exam in Quantum mechanics is equivalent in complexity to the Landau theoretical minimum. Solid knowledge of theoretical physics and ability to apply it in order to perform reliable calculations of real physical effects are crucially important for valuable interpretation of new experimental findings as well as for development of successful ideas towards new technological applications. Program is aimed first and foremost at giving researchers a grounding in mathematics and deep knowledge of mathematical physics. It also offers students the chance to pursue in-depth study of the fundamental models of modern theoretical physics. Students are expected to take part in research projects alongside eminent specialists, teachers, and foreign colleagues specially invited to participate. The crux of our students’ scientific career involves compulsory scientific seminars and mandatory attendance at summer and winter scientific schools. This program has no analogs abroad and can be compared only with the master’s program in Mathematical Physics at the Department of Mathematics of the Higher School of Economics (HSE). That said, the programs at Skoltech and HSE do not compete with each other. In fact, they complement each other. An agreement signed by Skoltech and the Higher School of Economics combines the programs and they are organized and run as a consolidated educational program. 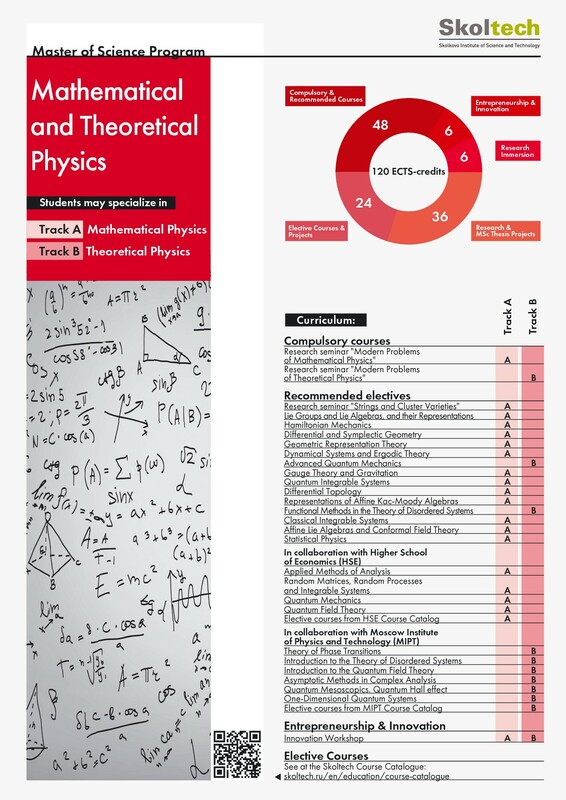 The main scope of the Theoretical Physics program is to provide top-level education and professional training for specialists in the field of contemporary theoretical physics, with the emphasis on condensed matter theory. Solid knowledge of theoretical physics and ability to apply it in order to perform reliable calculations of real physical effects are crucially important for valuable interpretation of new experimental findings as well as for development of successful ideas towards new technological applications. Graduate of the program should have the skills of a modern researcher in this field and to meet the highest professional requirements of leading Russian and international research and educational centers. They must have a broad professional vision, know the relevant methodological approaches, and have sufficient skills to participate in research projects. The program is realized in the network form with academic partners: the Moscow Institute of Physics and Technology and Landau Institute for Theoretical Physics. The key tenets of our Mathematical and Theoretical Physics educational program are compulsory scientific seminars (including student seminars) and a strong scientific community. Students study tailored, individual courses approved by their supervisors, who determine the range of selected courses depending on the specific area of the student’s scientific study. We put emphasis on students’ independent scientific study that encourages their rapid fundamental scientific (and thus career) growth. Continue education and research within the PhD program at Skoltech and leading leading scientific centers in Russia and abroad. Analytical methods and approaches to the broad range of physical problems: phase transitions (classical and quantum), thermodynamics and kinetics of mesoscopic systems and nanostructures, quantum field theory, hydrodynamics, quantum transport of charge, spin and heat, quantum-coherent effects in macroscopic systems, including qubit’s theory and engineering. Supersymmetric gauge theories and conformal theories. Specialist positions in various economy sectors including Skolkovo resident companies and startups.